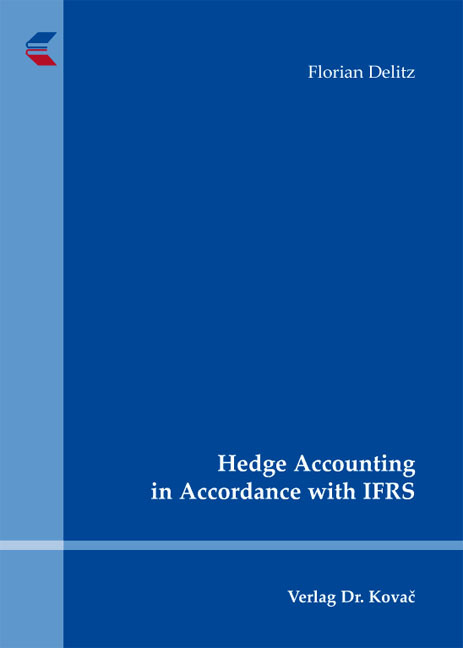 Hedge Accounting in Accordance with IFRS. Doktorarbeit von Florian Delitz, Verlag Dr. Kovač 2011, 202 S.
For a true and fair view, the joint presentation of the hedged item(s) and the hedging instrument(s) is necessary. The limited application of hedge accounting under IFRS is due to strict requirements, whereas some of these requirements are not justifiable from an economic perspective. The risk measure ’lower partial moment’ perceives risk as the shortfall from a benchmark and is therefore appealing investments and differs systematically from the traditional volatility. The interaction of the hedge model and the hedge effectiveness test should be considered from a theoretical and empirical perspective. A corresponding hedge effectiveness test and hedge model achieved empirically superior results compared to a hedge model that ignores the interaction. This investigation demonstrated empirically for several commodity markets that economically effective relationships frequently fail to qualify for hedge accounting under IAS 39. Moreover, the moment of the distribution in a LPM hedge model was found to respond paradox in the risk reduction measure. It was found that the quantitative assessment required by IAS 39 cannot be justified economically. The quantitative hedge interval is unable to discriminate between hedging and speculating by using derivatives since IAS does not define a quantitative risk measure. The empirical investigation demonstrated the strong influence of the estimation window on the hedge effectiveness assessment. Thus it is suggested that the beginning of the observations, the frequency of the observations, and the data source of the observations are included in the documentation requirements. In order to avoid retrospective manipulation, the documentation must be finalized at the beginning of the hedging period. IAS 39 discriminates portfolio hedges because the composition of the portfolio of non-financial hedged items is regulated. A risk model to hedge multiplicatively combined risks – such as commodity prices and exchange rates – was derived for a net position (macro hedge). Under regulatory constraints, hedge accounting for the optimal hedge portfolio cannot be applied. Micro hedge theoretically and empirically increased risk compared to the advanced hedge model. But IAS 39 allows hedge accounting for economically inferior strategies, while economical superior risk management strategies are discriminated.